Warm weather can cause problems for fish because oxygen levels drop and river flows and levels reduce. Although this is normal in the summer months, it is sometimes necessary for us to go in and rescue the fish - a job for me and my colleagues in the fisheries team. The River Tarrant in Dorset is a little gem of a stream and is unique to the area. It is one of the River Stour’s few chalkstream tributaries and is of great importance for its ecosystem locally and for the Stour. It is very productive and acts as an important area for young fish to develop for brown trout, salmon and grayling. Migratory salmon and sea trout still regularly use the Tarrant to spawn. The river is fed by underground streams but during warm weather the river level can sometimes fall and dry out, leaving large pools which leave fish stranded. Luckily there is a lot of local interest in the river so people regularly get in touch with us when flows become low. We’re always grateful to members of the public who help act as our eyes and ears. During recent low flows we worked closely with the River Tarrant Protection Society to quickly save hundreds of fish in danger. Using a system known as ‘electro-fishing’, we introduced a small electric current to the water using a metal probe to momentarily stun the fish and allow them to be caught and moved to safer waters downstream. Although this sounds scary it does not harm the fish. Along with large trout, of which some were too large to fit into the buckets we were using and had to be carried to safety in separate containers, we also rescued grayling, two eels and a plastic duck - a remnant from an annual duck race held in a local village! We are very grateful for the help and support of landowners and the River Tarrant Protection Society who helped us not only relocate hundreds of fish but also help with the long-term sustainability of the River Tarrant’s brown trout population. Spotted fish in distress? Report it to the EA’s free 24 hour incident hotline on 0800 80 70 60. This month is National Fishing Month and an opportunity for would-be anglers, young and old, to give fishing a go. Between 18 July and 31 August events will be taking place all over the UK. There is more information and a full list of events on the National Fishing Month website. 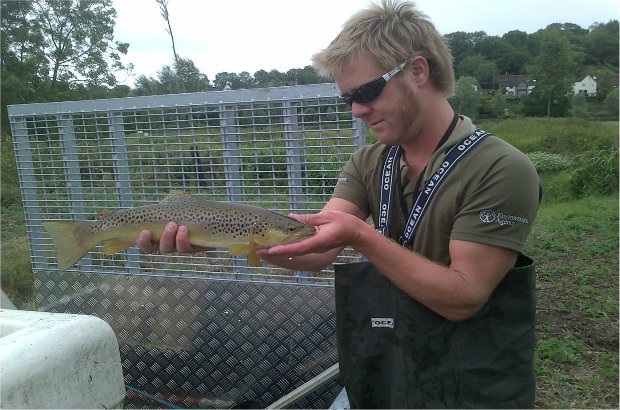 Fisheries Enforcement Officer Jim Allan started working for the Environment Agency in 1997 as part of the fisheries team in Blandford, Dorset. One of his first jobs was to rescue fish from the River Tarrant eighteen years ago almost to this day.